We just got back from our annual trip out West. It was so wonderful and fulfilling to visit family! I was really set on keeping our van and stuff organized this trip. I gave it a lot of thought, researched, and planned ahead on things I could do to cut down on the mess. We've been doing this driving-across-the-country thing a few years now and I feel like slowly, over time, I'm getting better and better at preparing for it. Organizing and planning ahead is not always my forte, so I'm really proud of myself whenever I make strides in that area! This year it occurred to me that maybe some of those people who I perceive as 'organized' have simply learned what works for them. There might be hope for me! 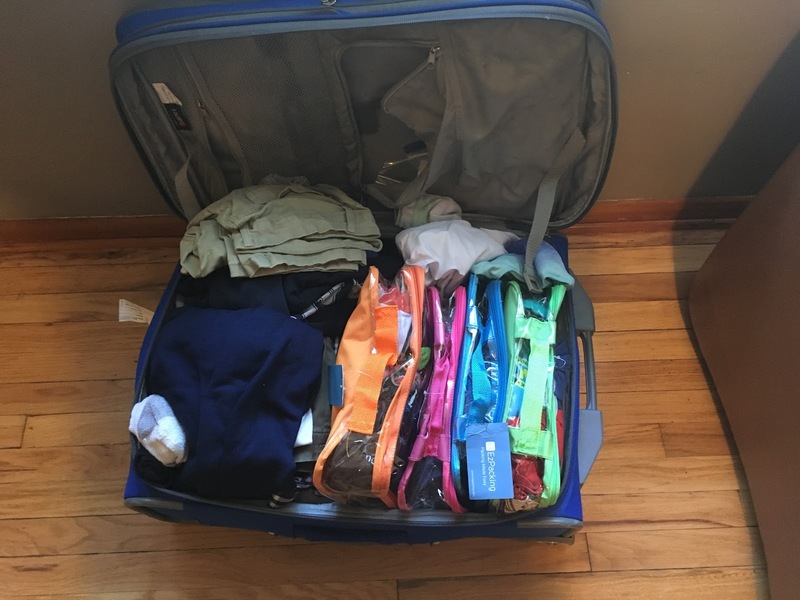 I implemented a bunch of different things this time, but these are two things we did this year that were novel and made a big difference in keeping my family of six organized the 10 days we were living out of suitcases and traveling. 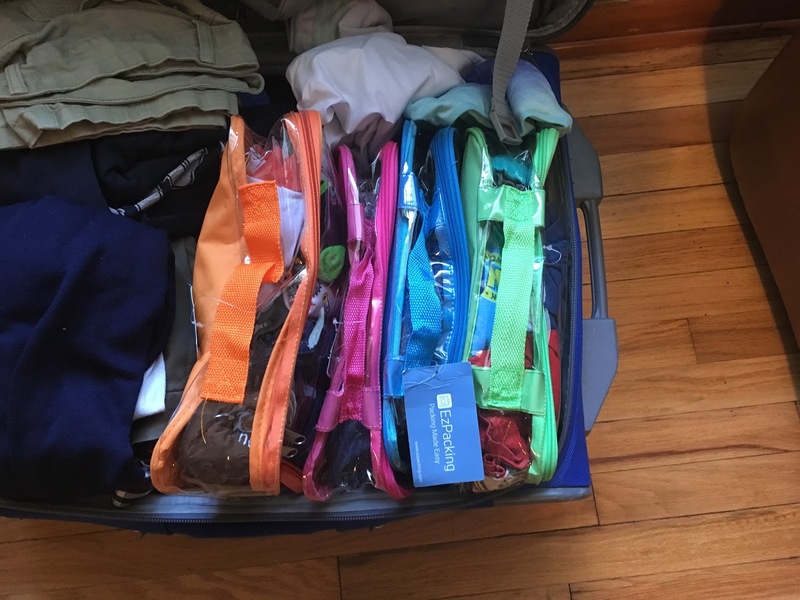 I think I'm behind on the packing cubes trend, but these have been a lifesaver! Each kid had their own cube with three or four shirts, pants, socks, and underwear. Inside the cube, I put the underwear in a ziploc bag, and socks in a ziploc bag. I rolled up the clothes so they were easier to see all at once. The cubes were color coded, so each kid had their own color and knew which one was theirs. I only bought four medium cubes for my small children, but I will eventually buy the bigger cubes for Ben and I. They were just a little expensive to buy all at once. I bought them from Ez Packing. They were some of the cheapest I could find, and I liked that they were clear, color coded, I could buy them individually, and they had several sizes. They also have a nice handle on the top which works really well with the way I store them in the suitcase (idea from here). They seem to be good quality, so hopefully they will last a good while until I have to upgrade my kids to the bigger size. 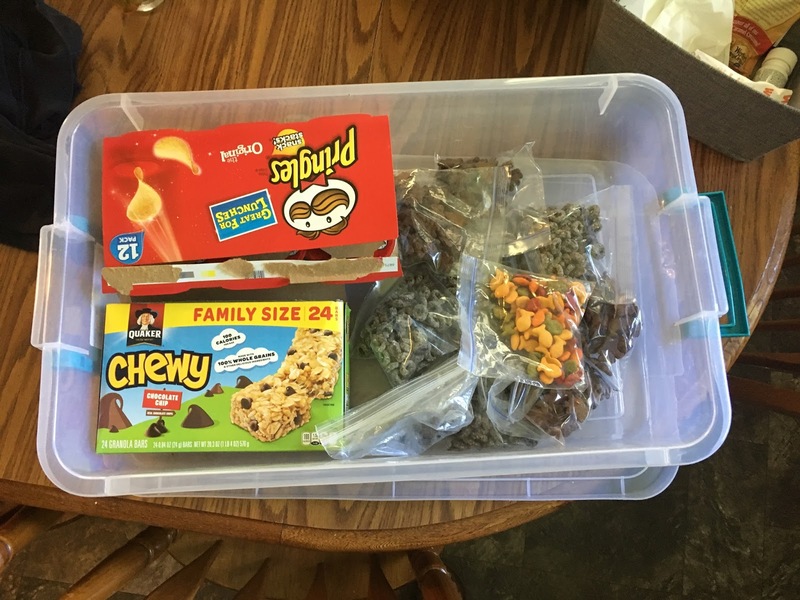 I bought two stacking storage containers (idea from here) for my kids' coloring books/activity books/books and our snacks/breakfast foods we would be eating in the car. It worked out great! I've done other kinds of totes to organize this kind of stuff before, but this size and tote has been my favorite so far for our van. I kept the snacks in little ziploc snack bags in the container in the back, and then if we ever needed to stop I would pull a few up front in case somebody got hungry. 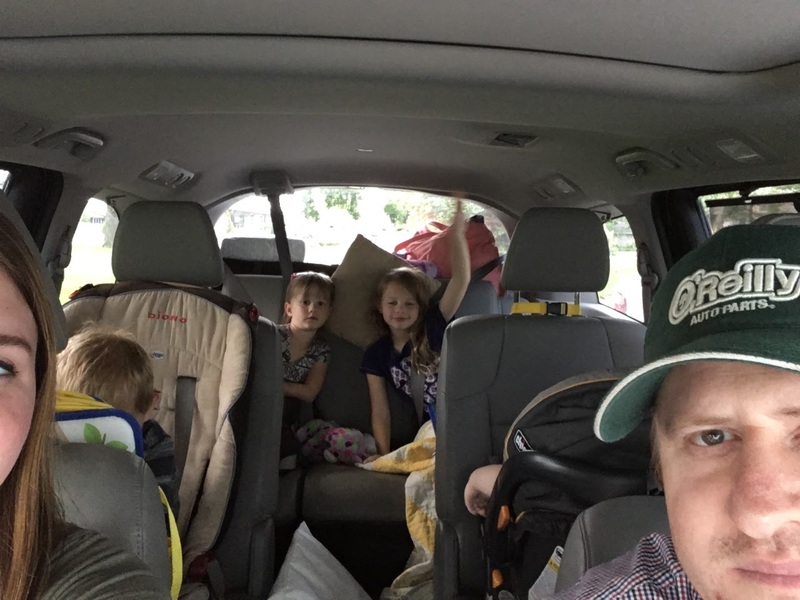 It's nice not to have access to all of them all the time (so you don't burn through snack food), and it saved us several times while driving and even at some of the activities we were doing with family, since they were always in the car. Each time we stop (every couple of hours. For lunch, or to fill up the car, switch drivers, or whatever) the kids get to trade one activity book for another. If I know it's going to be awhile before we stop, I'll let them pick two. It keeps the car from getting full of stuff, and keeps that 'novelty' feeling spread out for the whole road trip. 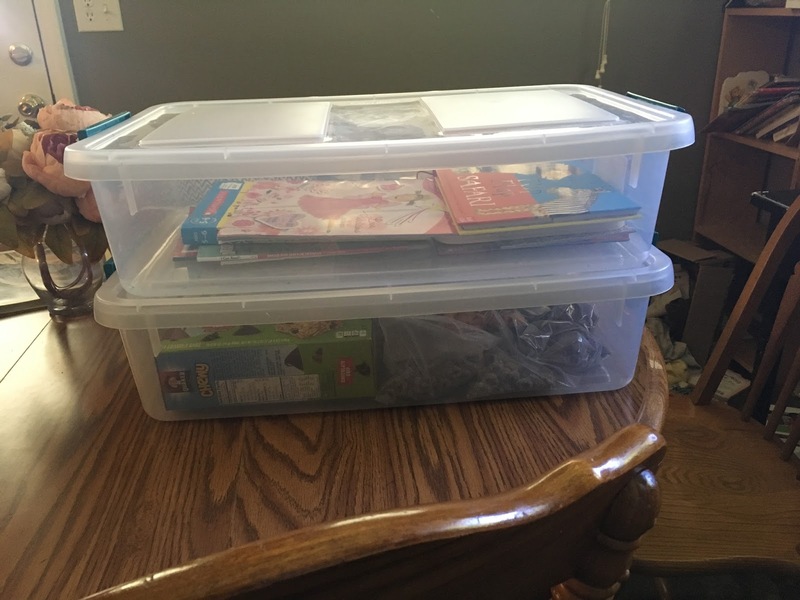 -Storage bins in the car. I bought a few cheap, small storage bins to corral small items in the car like water bottles, the driver's snacks, cds, etc. It works way better than the grocery bags I was using to do this before! -Keep all the shoes in a trash bag and only bring them out when you need them. 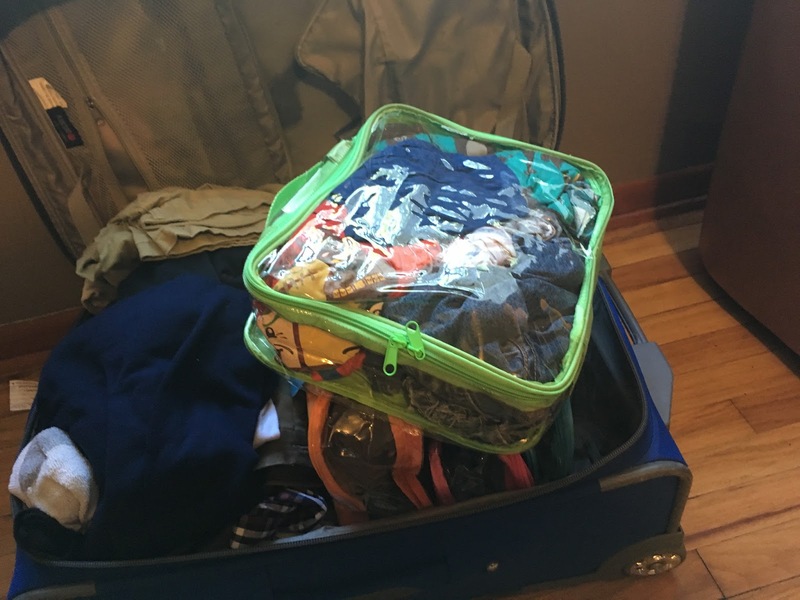 Keeps your clothes clean in the suitcase! -Plan on somebody throwing up, peeing their pants, and getting hurt on your trip (all three of these things happened on our trip). We were more prepared for this than in times past. 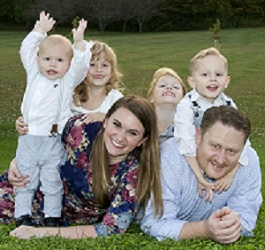 Then you don't have to stress out when it happens because you were expecting it, and just remember that it's all part of traveling with little kids. -Bring a box of trash bags and put a bag in the front of the car and in the back row. In the past I've used grocery sacks, but they can get easily lost or tip over when they are full of trash. Using a full size trash bag may not be economical, but if it keeps your car cleaner when you are driving across the country, it's worth it! -I bought these at Dollar General for giving kids food at breakfast and lunch. They worked great! I also saw them at Walmart.